Pro-abortion-rights activists hold signs alongside anti-abortion-rights activists outside the Supreme Court last month. 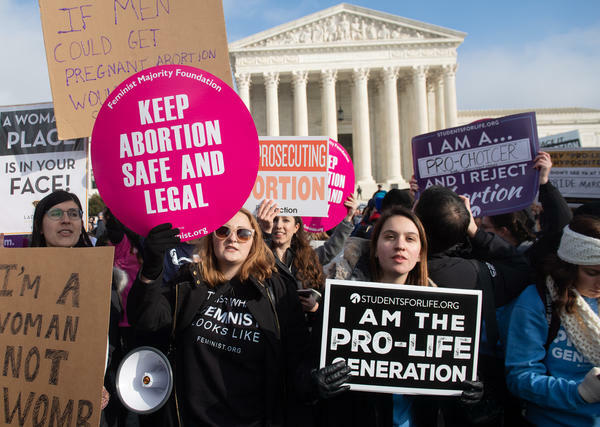 The Supreme Court, divided 5-4, has temporarily blocked implementation of a Louisiana abortion law nearly identical to the Texas law the high court struck down in 2016. The court's action, however, is only a pause. Chief Justice John Roberts sided with the court's four liberal justices in voting for the stay. Justices Clarence Thomas, Samuel Alito, Neil Gorsuch and Brett Kavanaugh opposed the stay. Kavanaugh wrote a dissent that said he would have let the law go into effect because the appeals court had said "the new law would not affect the availability of abortions from ... the four doctors who currently perform abortions at Louisiana's three abortion clinics." Kavanaugh's dissent deferred to the precedent of the case in which the restrictive Texas law was overturned in 2016. But dissent signals Kavanaugh's openness to state restrictions on abortion rights with limitations and without overturning Roe v. Wade outright. The question, Kavanaugh wrote, is whether three clinic doctors without hospital admitting privileges can obtain them. "If they can ... then the new law would not impose an undue burden for purposes of [the precedent in the Texas case]." He added that if they can not, "then even [Louisiana] acknowledges that the law as applied might be deemed to impose an undue burden." Like the Texas law that the court previously struck down, the Louisiana law requires any doctor performing an abortion to have admitting privileges at a nearby hospital; it also requires that clinics that provide abortions be, in effect, minihospitals, with everything from wide corridors to expensive equipment. The Supreme Court said in the Texas case that neither was needed to protect women's health and that both requirements imposed "a substantial burden" on a woman's right to abortion. Louisiana has conceded that its law is virtually identical to the Texas law. The difference between then and now is that Justice Anthony Kennedy, who cast the decisive fifth vote in the 2016 Texas case, retired last June and has now been replaced by Trump appointee Kavanaugh. The Louisiana law has never gone into effect. It was blocked after U.S. District Judge John deGravelles held a hearing and found that the state law is a remedy for "a problem that does not exist." He noted that abortions performed in Louisiana are "safe procedures" with "very few complications" and that in the "extremely rare" cases where serious complications arise, Louisiana law requires clinics to have transfer agreements with local hospitals, where patients are routinely treated by hospital staff. DeGravelles further found that were the Louisiana law allowed to go into effect, only one clinic and one doctor in the state would be qualified to perform abortions. Even if that doctor worked seven days a week, the judge said, the physician could not provide for the 10,0000 women a year seeking abortions in the state. Louisiana appealed to the U.S. Court of Appeals for the 5th Circuit, and a three-judge panel voted 2 to 1 to allow the state law to go into effect. Writing for the majority, Judge Jerry E. Smith conceded that the state had not provided any instance in which a patient sustained "a worse result" because a doctor lacked hospital admitting privileges. Nonetheless, Smith maintained the the Louisiana law did not impose "an undue burden" on women seeking abortions. He said the closing of clinics would not impose driving distances as long as those in Texas, and he said that it was easier to get hospital admitting privileges in Louisiana. Finally, Smith rejected the district court's factual finding that the law would make access to abortion more difficult for 70 percent of women seeking abortions in the state. Smith put the number instead at "at most 30 percent." Judge Patrick Higginbotham, a Reagan appointee like Smith, dissented, accusing his colleague of failing to "meaningfully apply" the Supreme Court's prior rulings on abortion. The 5th Circuit is among the most conservative federal appellate courts in the country. Eleven judges on the appeals court are Republican appointees, five of them Trump appointees. Of the 11 active Republican appointees, only one, a George W. Bush appointee, voted to rehear the case. One, a Trump appointee, was recused. With the Louisiana law about to take effect, abortion providers in Louisiana went to the Supreme Court, seeking an emergency order putting the lower court decision on hold until it can be reviewed by the nine justices. The high court has now agreed to grant that pause in the litigation, but it could still refuse to hear the case and leave the lower court decision in place. That would be a tacit acknowledgment that a majority of the justices no longer support the 2016 decision, and an invitation to anti-abortion state legislatures to pass more laws aimed at gutting Roe v. Wade without reversing it outright. The court, of course, could accept the Louisiana case for review next term, reopening the abortion debate, and perhaps even entertaining the possibility of reversing Roe.